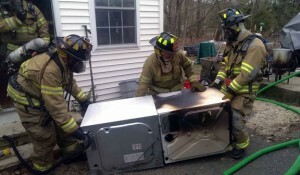 BEACON FALLS — Firefighters quickly doused a dryer fire on Cook Lane Monday afternoon. Members of Beacon Hose Company No. 1 responded to 25 Cook Lane at about 12:10 p.m. Smoke was coming from the rear porch of the house when firefighters arrived, and the fire was located in the first-floor laundry room of the house. The fire was contained to the laundry room and was extinguished within approximately 5 minutes. Firefighters removed the dryer from the home and ventilated the house. Fire Chief Jim Trzaski said a woman who was home at the time of the fire wasn’t injured. Three dogs and a pet iguana also were unharmed, he said. Due to smoke damage, the homeowner was temporarily displaced, he said. Firefighters from Naugatuck and Seymour provided mutual aid.